Ah, the beauty of simple homemade products. PS: Parenthesis are my friend today. I’ll end the over-usage right now (promise). Oops. 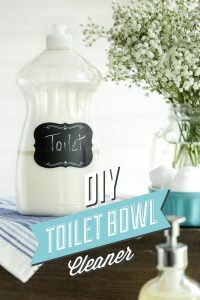 What makes this DIY cleaner so inexpensive, effective, and edible? I’m so glad you asked! After all, those are big shoes to fill. It’s not every day one finds a cleaner claiming such noble qualities. Vinegar: Yep, the same stuff used to make homemade dressings, pickles, and so much more. Vinegar not only tastes amazing, when perfectly combined with the appropriate foods, but also naturally cleans and disinfects. The real cleaning power found in vinegar comes from a fancy acid called acetic acid, a germ-fighting superhero. Vodka: Vodka has quite the reputation, and it’s not all bad. In fact, vodka is a pretty amazing cleaner that often gets overlooked. In the past, vodka (alcohol) was used to sterilize medical equipment in hospitals. Vodka’s magical cleaning power may also be used to lift stains and fight grease. Vodka also lifts odors (see my homemade air freshener recipe). 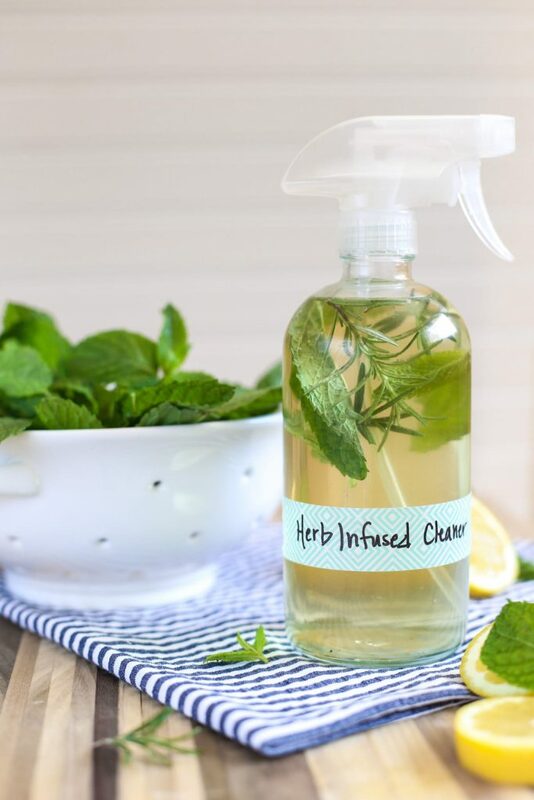 Fresh Herbs: Fresh herbs add natural fragrance and beauty to this homemade cleaner, and offer beneficial cleansing properties. 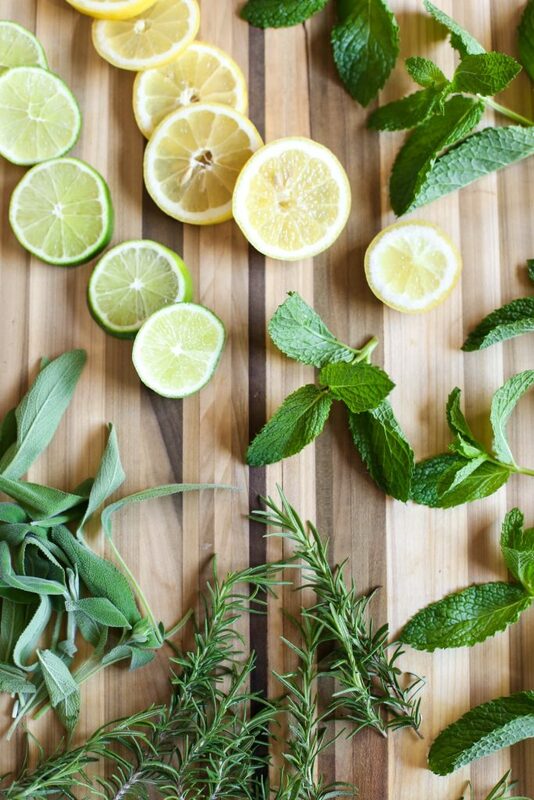 The best fresh herbs for cleaning are: peppermint/mint, lavender, rosemary, sage, and thyme. 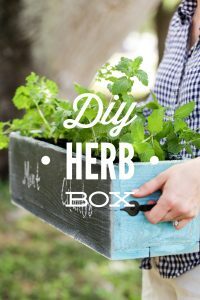 Since most gardens are currently overtaken by flourishing herbs (hello, summer! 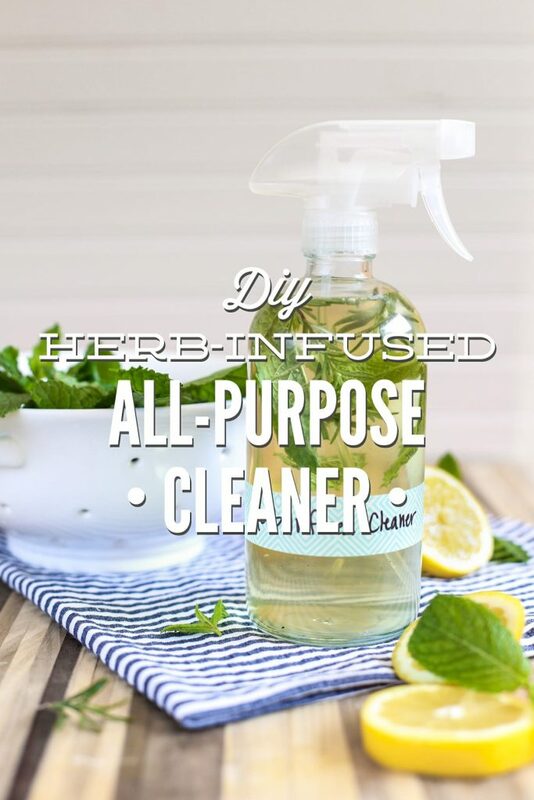 ), now is the perfect time to make an herb-infused all-purpose cleaner. If you’re not growing any herbs right now, don’t fret! Markets and grocery stores are usually eager to sell herbs this time of year, which means low prices and a large selection. Free or inexpensive fresh herbs means an effective homemade cleaner can be made for just pennies. Today’s DIY requires only three ingredients (okay, more like five if you add the optional ingredients). With only three ingredients we’re going to make an all-purpose cleaner (it seriously does everything) that’s 100% edible (except when you add one of the optional ingredients–darn optional ingredient). 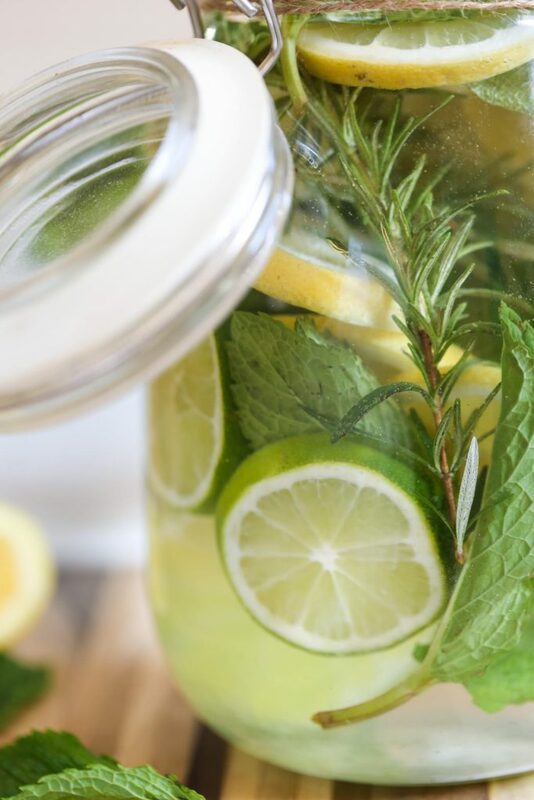 In a large mason jar (quart-size works well), add the fresh herb(s). Use a muddle or the back of a wood spoon to crush the herbs and release the fragrance. You may also crush the herbs by rubbing the leaves in between your fingers, then adding the herbs to the jar. Add the citrus to the jar, if using- just the peels or sliced citrus. 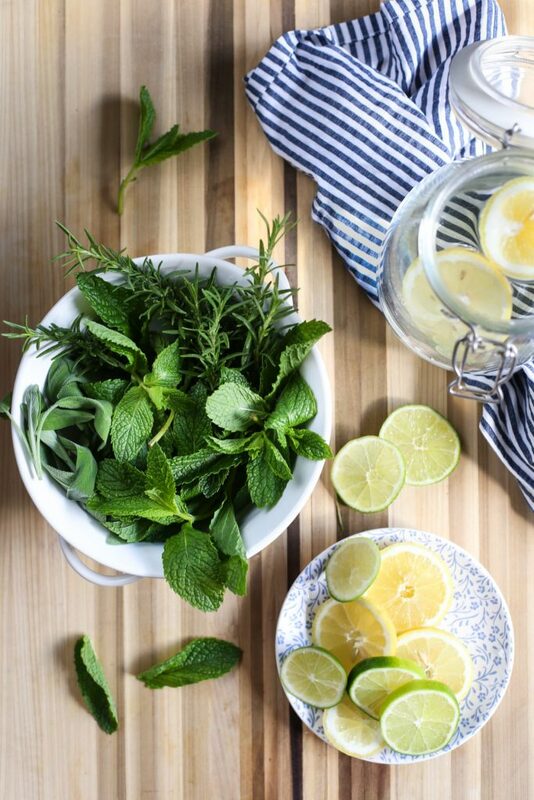 Pour 1 part vodka and 1 part vinegar into the jar so the herbs and citrus are fully immersed. Add the essential oil(s), if using. Allow the sealed cleaner jar to rest for at least 14 days at room temperature. To Use: Pour the cleaner through a sieve to remove the herbs and citrus. Pour the cleaner into a spray bottle(s). I like these glass spray bottles. This cleaner is concentrated, so the solution may be diluted with 1 part water and 1 part cleaner, or used full-strength. Use on dirty surfaces, glass, or stainless steel. Store extra cleaning solution in the fridge for long-term use. Option 1: If you’d like to skip the alcohol in this recipe, simply sub more vinegar in place of the vodka. This will result in a cleaner with a heavy vinegar scent, so you may want to add more herbs and/or essential oil(s). Option 2: If you’re short on time or don’t feel like warming the vinegar, you’re welcome to use room temperature vinegar. Note: I don’t actually recommend drinking this recipe. 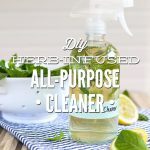 Let me say that another way, “Don’t drink this recipe!” While this cleaner is 100% edible, I recommend opting for a glass of water or kombucha versus a glass of homemade all-purpose cleaner. I am fairly new to the all natural world, and I have scoured the internet for information from toothpaste, cleaning my home to natural for my pets, I still have a long way to go. I stumbled across your website and it was loaded with information for me, I read your blogs all the time as I continue to learn about this new world that I am loving. I love these blogs and you have inspired me on so many things, I work every day and I have found it so easy to follow this lifestyle. Food is next and I will be checking your blog to get my family’s diet in check too. Again Thank you. Hey Teresa, Thank you so much for sharing! I’m so excited for you and your journey. Keep up the amazing work! Thank you….I really enjoyed the your infusion recipe. It is so practical and no neat. 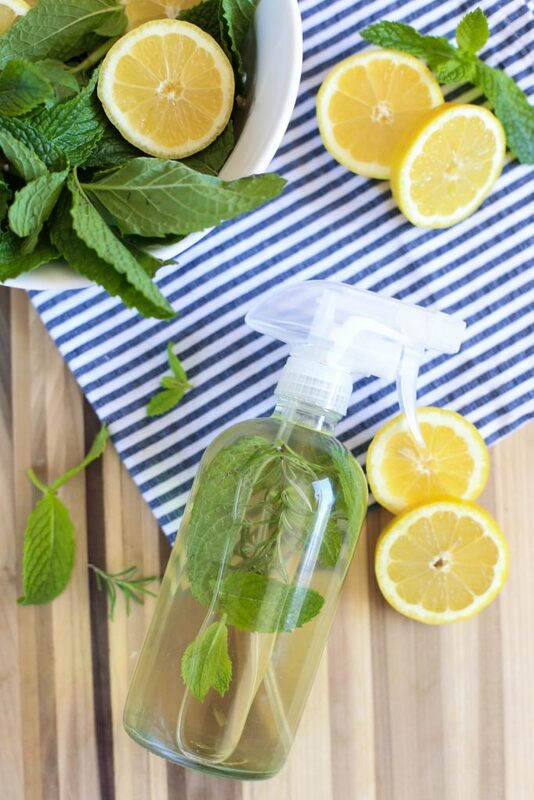 Question: I see the herbs and citrus in the spray bottle pictures, but you say to filter them out. No herbs/citrus in the spray bottle? Also should I store both the left overs and the spray bottle in the fridge? Hey Maria, Yes, I recommend straining them, but you’re welcome to add a couple of fresh herbs/citrus rinds to the spray bottle for appearance and added scent benefits. Depending on how quickly you use the cleaner, I recommend storing both the spray bottle and leftovers in the fridge for long-term use :). This all purpose cleaner seems great! It will definitely will smell very fresh 🙂 I am a professional cleaner (Carpet Cleaning Brompton Ltd.) and I love making my own cleaning sprays. 🙂 Thanks for sharing! Hey Abby, It should last a few months since the vinegar keeps it preserved. I’m not sure about the exact time frame. 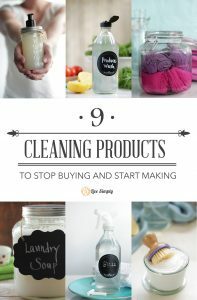 As long as the cleaner doesn’t look moldy or filmy, or have an off smell, it’s okay! What are your favorite scent combinations? Is this cleaner safe around cats? They like to jump on counter tops so I just want to make sure! Hey Ambrylnn, I’m not sure. The only concern would be any essential oils added to the mix, I think. I’m not a cat expert, sorry.